I’ve been thinking about turkeys. No, not the ones many people ate yesterday, rather, the ones I saw scuttling through the woods all the years of my childhood. The ones I see now running across the road, traveling through meadows, and huddling together in the farms as we drive over the river and through the woods to grandmother’s house. 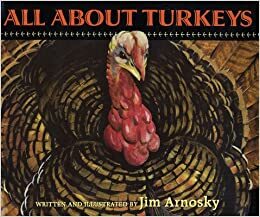 When I came across Jim Arnosky’s All About Turkeys, I thought it would be a timely read. Arnosky has so many books and so much experience that it was impossible to expect anything but the best from this book. And he didn’t fail to deliver. His illustrations are beautiful, accurate and colorful depictions of wild turkeys. He shows some actual size parts of the birds, as well as enlarged images with a great depth of detail. Readers can learn much from the illustrations alone. All About Turkeys is not the most original title for a book, but it does indeed tell us all about turkeys. Arnosky offers numerous facts about wild turkeys, both in the main text, as well as in small tidbits thrown around the pages. We learn that turkeys have binocular as well as monocular vision. We see the actual size of turkey feet and heads. And we discover how turkeys got the name gobblers. My favorite fact, however, was something I did not know: A turkey’s head can change color. It is featherless and when calm, it is grayish violet. When the bird gets worked up about something, the head turns red, white and blue! This change can happen in less than a minute. The ability for turkeys to change their coloring is astonishing, but equally astonishing is that I didn’t know this! It reminds me that there is so much left to learn, for me as an individual, but also for the whole of humanity. Scientists know more about our earth than I ever will, and yet there is also so much more to learn that in a hundred or five hundred years, humanity still won’t know it all. I hope we never stop studying, exploring and seeking to understand the workings of this astonishing planet around us. For me, as I considered turkeys, I was pleased to discover All About Turkeys, which shows me there is always one more wonder of nature to be grateful for. This is a true story about a boy, his connection to animals, and how he became the “Indiana Jones of wildlife conservation”. 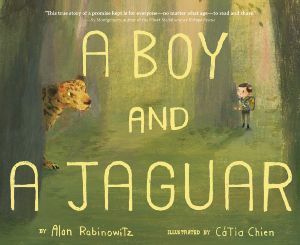 Alan Rabinowitz loves the jaguar. He can talk to her. He also loves his chameleon, gerbil, and snake. He can talk to them, too. The only animals he can’t talk to are human. Alan stutters, and no one – not his dad or his teachers – can understand him. So when he talks to his animals, Alan promises that if he can ever find his voice, he will be their voice and keep them from harm. When he grows up, Alan studies jaguars. But they are being hunted nearly to extinction. Alan knows he has to protect them – and that means talking to government officials. Check out “beyond the book” activities at Archimedes Notebook. 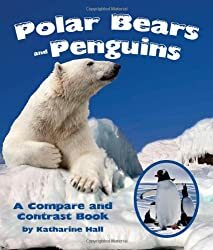 Booktalk: Polar bears and penguins may like cold weather but they live at opposite ends of the Earth. What do these animals have in common and how are they different? …but penguins live in the Southern Hemisphere. “Ears are for hearing, eyes are for seeing, and noses collect smells.” But what are we trying to see? Or hear? And what is that stinky smell? 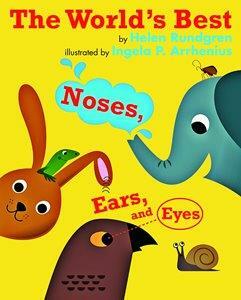 This book offers a fun look at the diversity of noses: long noses, short noses, funny looking noses. There are hedgehog noses and moth noses, elephant noses and shark noses and the very dazzling nose of the star-nosed mole. There are lizard ears and bunny ears, cricket ears and funny ears. We look at the biggest eyes and eyes on stalks, eyes that see at night and eyes that see hundreds of images at once. And then there’s us. Humans. We’re pretty average when it comes to eyes and noses and ears. Is there anything we do better than other animals? This easy-reader makes good on the title’s promise. Each page features an animal at work. The text is simple subject/verb construction: “A dog herds. A horse carries.” The illustrations show an animal doing its work, from herding sheep (dog) and lifting tree trunks (elephant) to mowing the lawn (sheep) and protecting the herd (llamas). Lewin includes the important work of a companion animal, too. At the back is a map showing where the featured animals live. Head over to Archimedes Notebook for some beyond-the-book activities and one more animals book. 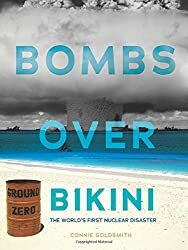 Booktalk: In 1946, as part of the Cold War arms race, the US military launched a program to test nuclear bombs in the Marshall Islands of the Pacific Ocean. From 1946 until 1958, the military detonated sixty-seven nuclear bombs over the region’s Bikini and Enewetak Atolls. The twelfth bomb, called Bravo, became the world’s first nuclear disaster. It sent a toxic cloud of radiation over Rongelap Atoll and other nearby inhabited islands. Snippet: “I began to feel a fine powder falling all over my body and into my eyes. The coconuts changed color. By now all the trees were white, as well as my entire body. I didn’t believe this was dangerous. The powder fell all day and night over the entire atoll of Rongelap,” Moyor John Anjain later recalled. Have you ever wondered how baby animals learn? Are they born knowing everything they need to survive or do they learn from their parents and peers like we humans do? Animal Teachers by Janet Halfmann and illustrated by Katy Hudson is an award-winning new picture book that explores these questions. Janet Halfmann has found fascinating examples of animal babies that learn from their parents and some of these are likely to surprise the reader. Did you know that cheetahs need to learn to run or that baby chicks need to learn what to eat? Each page brings new discoveries. In the text, Janet has used what could be described as a “reverse Q & A.” In each two-page spread she first tells what a baby animal learns from its parents and then at the end of the section asks a few questions. This results in a conversational tone that engages the reader and leads to much deeper discussions of the topics. At the end of the book are two pages of additional bullet point facts about the animals featured in the text. These are just the kind of facts that youngsters absorb like sponges and then “teach” to their classmates. Overall, Animal Teachers is a fascinating, warm book that introduces the fairly complex topic of animal learning to the youngest reader. You will definitely want to share with young animal lovers. Check our full review at Wrapped in Foil, as well as some related information and activities at Growing With Science. Sue also has a fun review of this title at STEM Friday. Categories: Science, STEM Friday round-up | Tags: Animal Teachers, Janet Halfmann, Katy Hudson | Permalink. 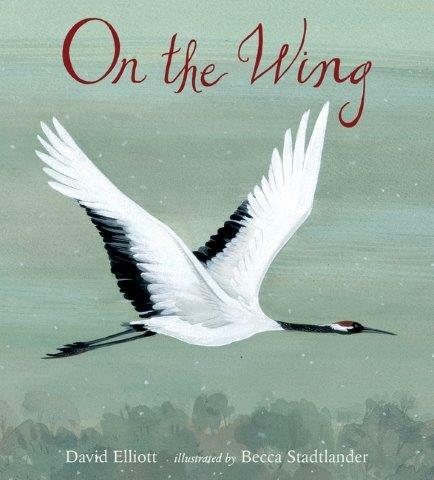 From hummingbirds to eagles, this book waxes poetic about birds from all over in all kinds of weather. There are Japanese cranes dancing in the snow, flamingos, bowerbirds, condors and puffins. Elliott includes a few backyard feeder-friends we might already know: woodpecker, blue jay, cardinal, crow. 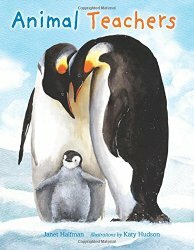 The illustrations are luscious, with details of feathers and beaks right on down to the toes. Head over to Archimedes Notebook for some “beyond the book” activities and thoughts on noisy turkeys.